Except I did. It may look utterly delicious and time consuming, but I genuinely had every single ingredient lingering in either my store cupboards, fridge or freezer. I had been stocking up on butter blocks all week in preparation for my parents Silver Wedding Anniversary cake so I had more than enough for sweet pastry. The remaing half of my frangipane from my Apricot and Lemon Frangipane Tart was neatly packaged in the freezer. I had cherries and blueberries spilling out my ears and the almond buttercream? Just chilling in a pastry bag at the back of my freezer next to some petit pois. I offered up my services to provide pud for the Pease Central contingent who descended on Fife late last week for the Silver Wedding party To cut down on stress (I made eight cakes the next day) I put together my favourite sweet pastry the night before and blind baked so that one job was done. I took the frangipane and buttercream out the freezer and prepared the fruit for the filling. 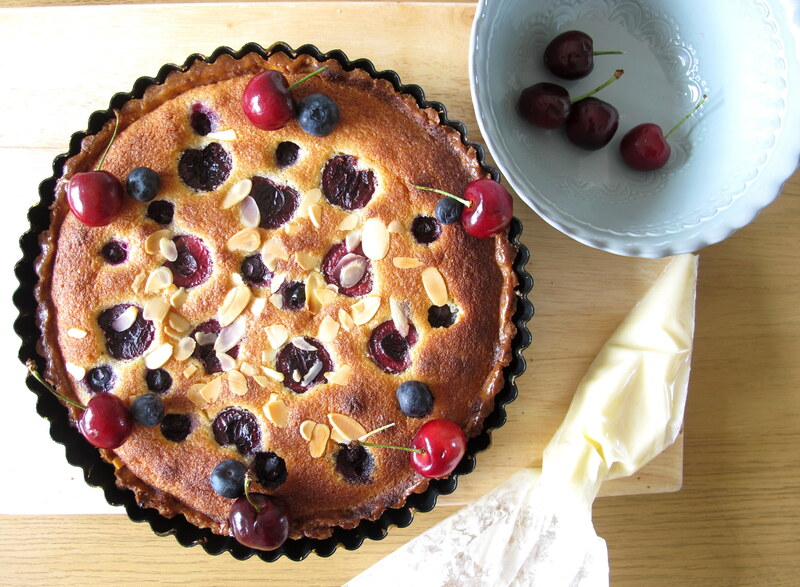 Then in the morning I simply cranked up the oven at 8am, smoothed sweet frangipane in the case and studded it with summer fruits and flaked almonds. A quick flash in the oven, six swirls of buttercream and some artful decoration later and this baby was packaged up and ready for munching. This is probably my favourite kind of baking – quick and efficient, but with beautiful results. I have repeated the recipe below, but by and large this is a slight modification on my last blog post. 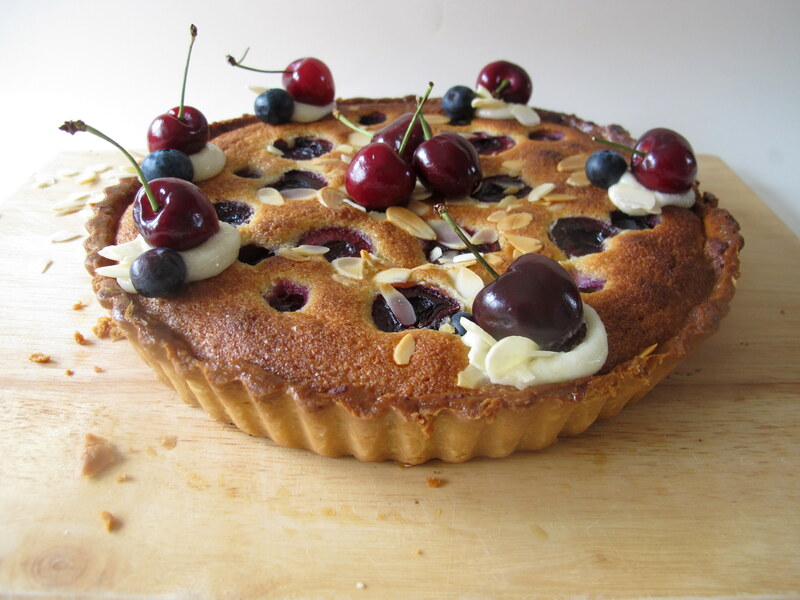 I just couldn’t resist though, I just love looking at the pictures of the cherry stalks curling from the top of the tart. Happy frugal baking friends! 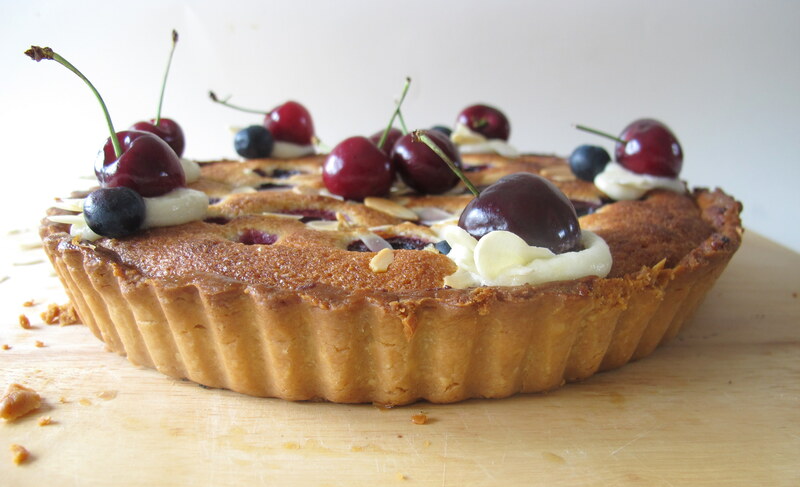 P.S A quick question readers – as I was in a little bit of a rush, I only really took time to take pictures post-baking of this tart. Do you prefer finished product posts or a step by step with pictures? Let me know in the comments! Tip: You won’t need all the buttercream so simply place straight in the freezer after using and defrost when required again. Do not refreeze. To make the pastry, whisk together the flour and icing sugar then rub in the butter carefully. Make sure you have cold hands to avoid melting the butter. Once the mix resembles breadcrumbs, add ½ to ¾ of the beaten egg and mix to form a pastry ball. The shortcrust needs to hold together but not be too wet. Wrap tightly in clingfilm and press down to form a flat disc then refrigerate for 30 minutes. Do not throw the remaining egg away. Dust a clean work surface with flour and roll out the pastry in a round bigger than the bottom of the tin – I used this 23cm fluted flan tin. Roll to a 5mm thickness then loosen from the surface with a palate knife. Carefully lift the pastry over your rolling pin and drape over the tin. Gently press into the fluted edges then cover with clingfilm and refrigerate for a further 30 minutes – this will eliminate shrinking. Preheat an oven to 200oc/180oc fan/Gas Mark 6. Cut the top off the pastry by rolling the pin over the top or by pressing with your thumb to form a neat edge. Place a sheet of baking parchment over the pastry and fill with baking beans or lentils. Bake for 15-20 minutes until the pastry feels dry. Remove the paper and beans and bake for a further minute to dry out. Brush the pastry with the remaining egg to seal and return to the oven for a final bake for 2 minutes. Cool the pastry case completely. If filling the next day, cover with clingfilm and leave in a place where it is unlikely to be knocked or broken. If using frozen frangipane from a previous recipe, defrost overnight in a mixing bowl covered with clingfilm. Preheat the oven to 200oc/180oc fan/ gas mark 6 and smooth the frangipane across the pastry case evenly with a spatula. Scatter or arrange the fruit on top, lightly pressing into the batter. Scatter with flaked almonds and bake for 25-30 minutes until golden. Remember to keep an eye on the frangipane as it can catch easily. Remove the tart from the oven and leave to cool on a wire rack. To make the buttercream, beat the butter in a stand or handheld mixer until smooth. Beat in the icing sugar, almonds, and vanilla, adding the milk slowly until you have a smooth icing that will hold its shape when piped. Spoon into a plastic piping bag and pipe six neat blobs around the outside of the tart. Top each blob with a cherry (keep the stalks on for a pretty effect) and a blueberry, pressing in flakes of almonds in a fan shape. 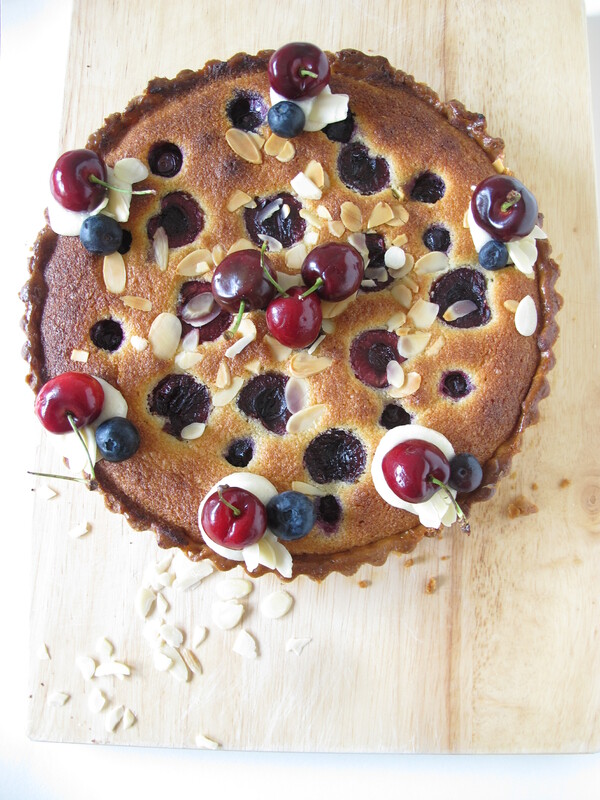 Scatter the rest of the tart with almonds then serve up with pouring cream or vanilla ice cream. 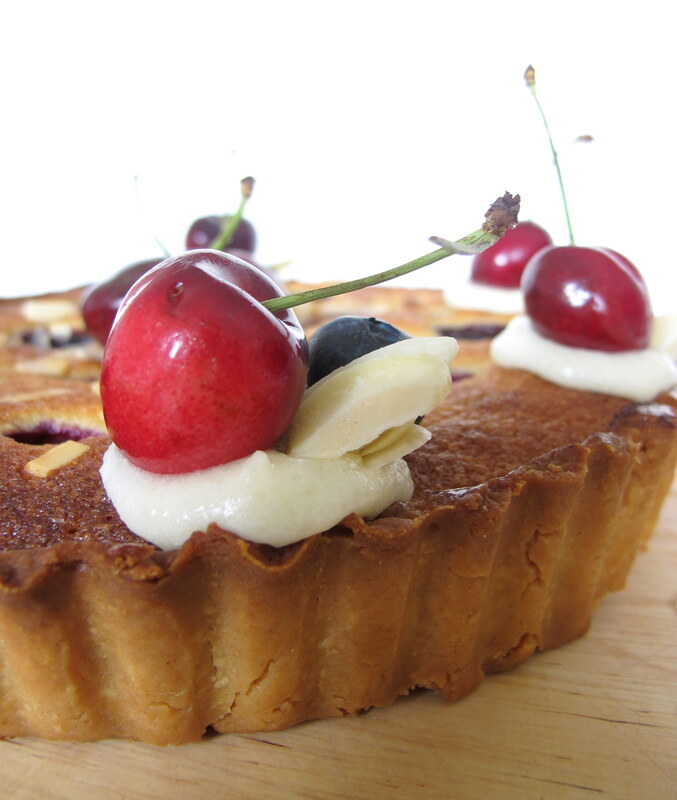 This looks really good, love a frangipane tart and this looks like a winner. Thanks very much, its fairly easy to master and very delicious!